Good evening, hope your humpday wasn’t too miserable. My sleep has been less than stellar so that meant I was dragging more than usual for a Wednesday. Oh well though I made it through and I’m almost ready for bed right after this post! 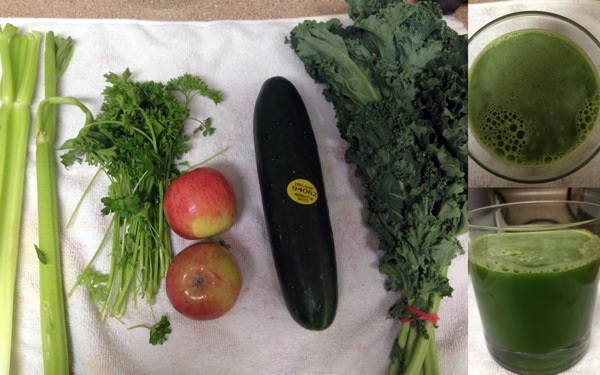 Got my green juice on again this morning, a little parsley for a little fun? I don’t know I just throw whatever in the juicer and drink what comes out. I enjoyed todays drink though, it was pretty gingery which is just the way I like it! 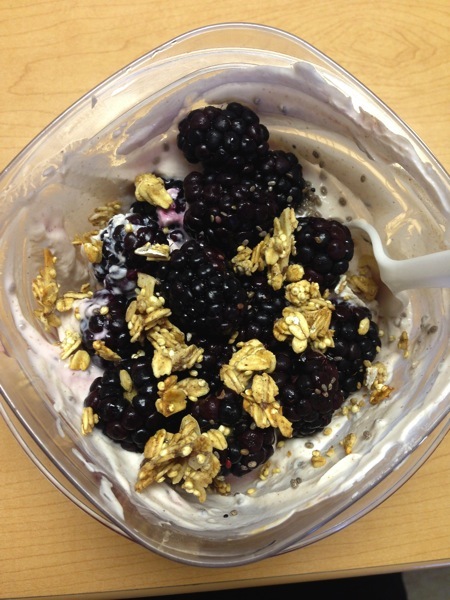 Around 8am I had my greek yogurt with quinoa granola that I packed the night before, it was a good one! 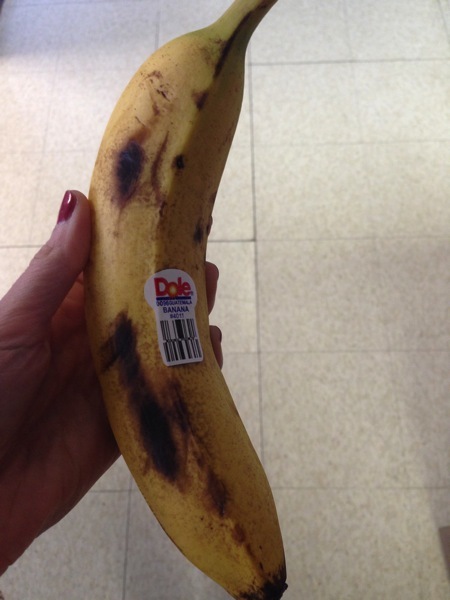 I’ve been having this weird forceful cravings lately, yesterday it was the granola bar and today it was a banana. So around 11:30am I snacked on a banana to hold me over till lunch. I had to work through lunch by being on a webinar, but thats okay because I had my amazing sweet and salty salad from heaven to enjoy. 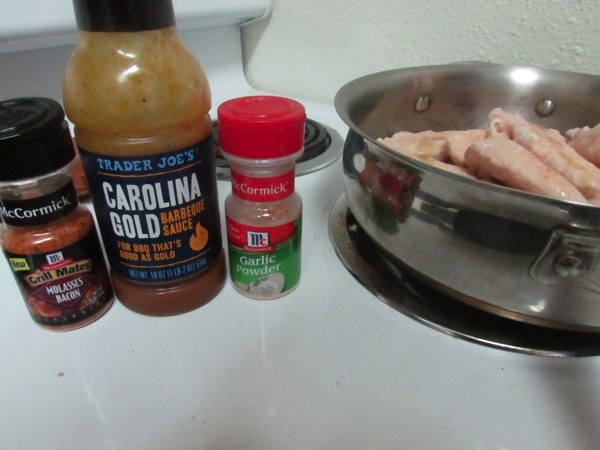 On Sunday Paul made up some BBQ chicken by marinating it and cooking it in BBQ sauce, molasses bacon seasoning, and garlic powder. 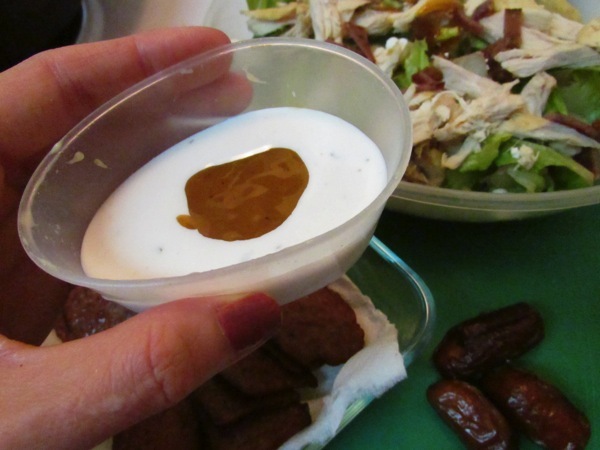 For the dressing: 1-2T Walden Farms Calorie Free Bacon Ranch dressing with 1T Carolina Gold BBQ Sauce and mixed it up in a mini portable container. Let me put it to you this way, this salad was SO good that I actually decided against treating myself to Chipotle tomorrow so that I could have this salad again. Ya, it was THAT good. 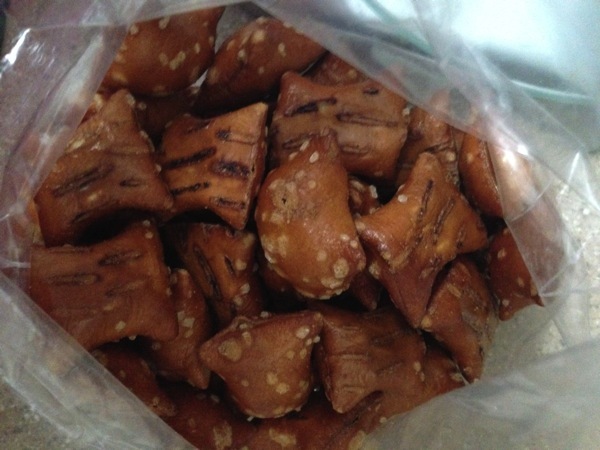 When I got home I dug into the peanut butter pretzels before walking to the chiropractor. I took the long way home, walking two miles in total. I would have done some upper body work but you really aren’t suppose to workout after getting an adjustment so it was dinner time for me! 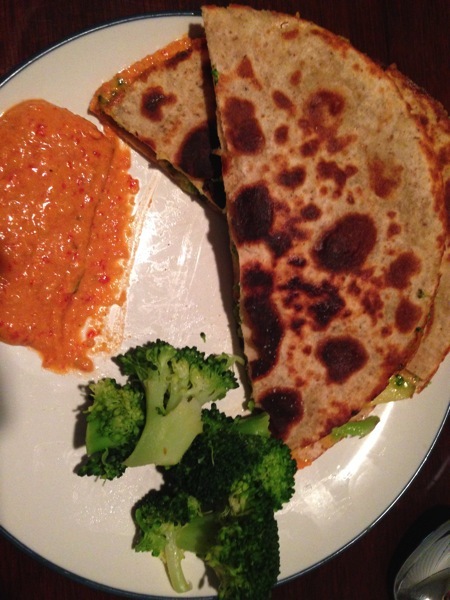 I steamed some broccoli and made a pretty amazing broccoli and cheddar quesadilla. I didn’t really measure anything that went into the quesadilla but there were two small la tortilla factory tortillas stuffed with a ton of cheddar cheese, a ton of chopped broccoli, and 1/4 of an avocado. 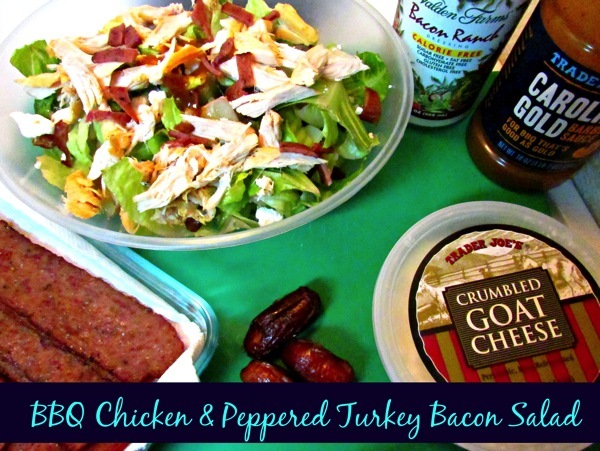 I ate it with some Spicy Mexican Hummus Yogurt Dip, which was an amazing combo. I think I could eat that same lunch and dinner every single day for the rest of my life. Now I’m done icing my hip/glute and I’m off to catch the end of the Wildcats game and then trying to get to bed early to catch up on my sleep deficit.